The hunt for stable income is an increasingly challenging task. Bond yields across major fixed income markets are at historically low levels, with some of the central banks in developed countries even going as far as adopting a negative rates policy. Together with an aging population that is living longer and relies predominantly on fixed income, it is no surprise that dividends have become a major source of yield. Not all dividends are the same. In a quest for yield, it is important to distinguish between stable yield versus absolute high yield. The S&P Dividend Aristocrats® Series fall into the former camp. Since the early 1970s, S&P Dow Jones Indices has been identifying stocks with a long history of consistent dividend increases, which we call “dividend aristocrats.” The S&P 500® Dividend Aristocrats is an index that consists of dividend-paying securities of the S&P 500 that have followed a payout policy of increasing dividends for at least 25 consecutive years. As shown in Exhibit 1, not every dividend-paying stock in the S&P 500 can become a dividend aristocrat. Between 1994 and 2016, the number of stocks that qualified to be part of the index ranged from 41 to 64, representing approximately 8% to 13% of the underlying S&P 500 universe. 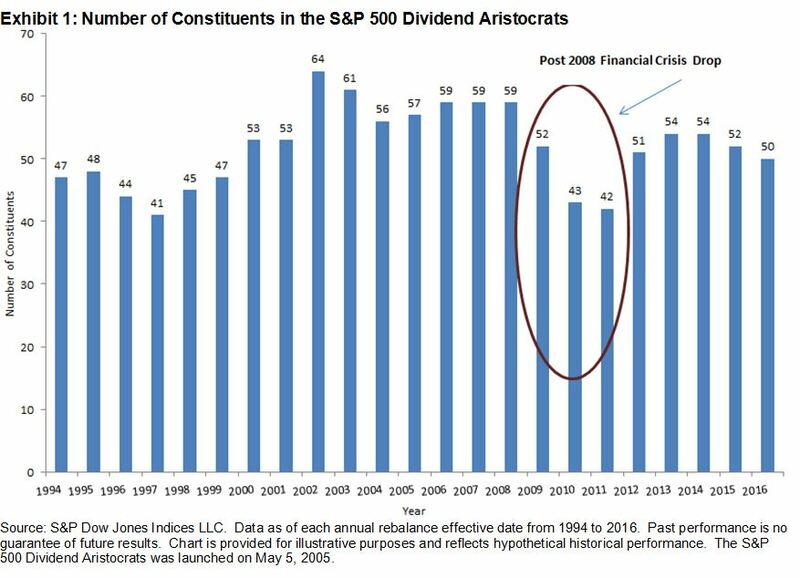 One can argue that the dividend aristocrats symbolize the tier-one, blue-chip companies with solid balance sheets, and therefore, they can weather market cycles. We can see what a difficult feat that is by observing the number of constituents from 2009-2011, the years following the 2008 financial crisis, when many dividend-paying companies either cut or omitted their dividends altogether. A portfolio that is constructed solely on the basis of highest-yield securities can potentially run the risk of overloading on the financials and utilities sectors, as those two sectors typically have stocks that pay high dividends. This exposes the portfolio to sector-concentration risk arising from sector-specific risk factors, such as adverse interest rate movements. 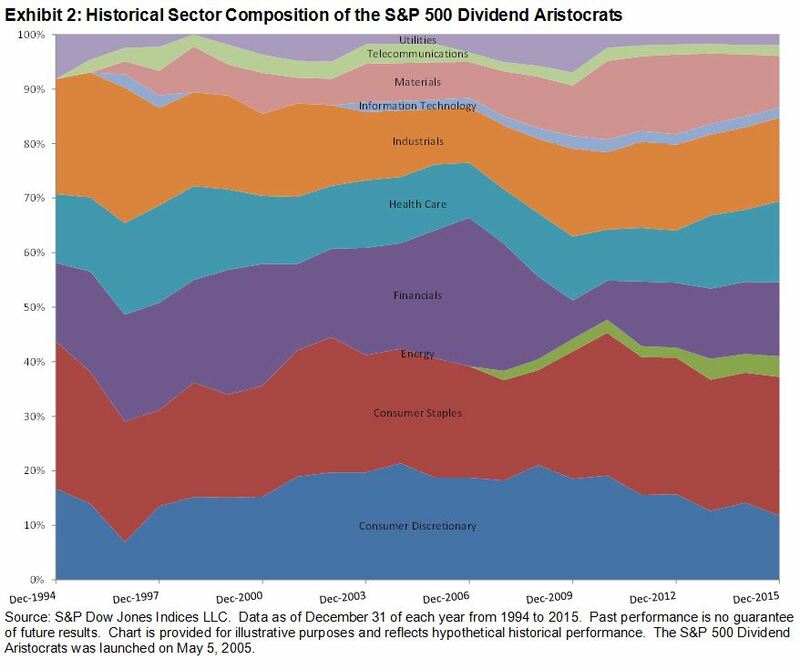 Since companies across all sectors may follow an increasing dividend-payout policy and can exhibit consistent dividend growth, the S&P 500 Dividend Aristocrats draws its constituents from a broad spectrum of industries (see Exhibit 2). The index is sector diversified, thereby reducing the risk of being overexposed to a particular sector and taking on large active sector risk relative to the underlying benchmark. Join us for a webinar tomorrow discussing the importance of dividend growers and their characteristics. We will be highlighting the importance of dividends in generating total equity return in addition to the risk/return characteristics of the S&P 500 Dividend Aristocrats.